In animation, a scene is the action happening in front of the camera while the camera does not change angle. As long as the camera does not stop "filming", you are in the same scene. To create scenes in a Studio project, you will use the Scene Manager section of the Storyline view. ‣ In the top area, click the New Scene button. ‣ Click the Menu button and select New Scene. ‣ In the Scene list, right-click on a scene and select New Scene. The new scene appears in the scene list. 2. To open a scene from the list, double-click on the scene's name. ‣ From the Storyline view, select a scene. ‣ In the Scene Manager, select a scene from the list. ‣ From the Scene View toolbar (Top toolbar on Mac OS X), select a scene from the drop-down menu. The scene`s properties are displayed in the Properties panel. 2. 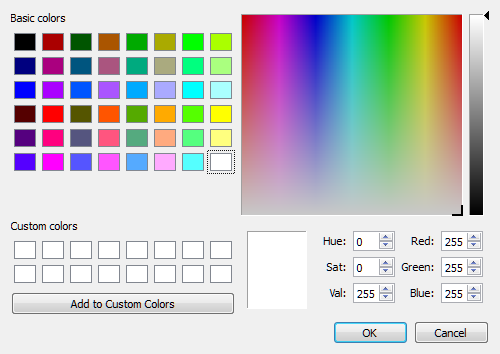 Click the Colour Picker swatch. 3. Select a colour and click OK.
2. Type in a new name in the Name field. 1. 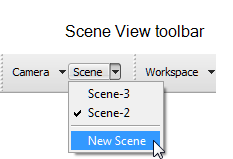 Select a scene from the Scene Manager. ‣ Click the Delete Scene button. ‣ Click the Menu button and select Delete Scene. ‣ Right-click a scene and select Delete Scene. The selected scene is removed from your list. 1. In the Scene Manager, select a scene and drag it to a new location. The reordered sequence is displayed in the scene area of the Storyline view. 1. 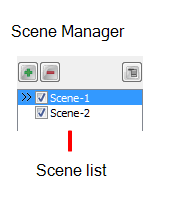 In the Scene Manager, select the scenes you want to appear in the Storyline view. Deselect the scenes you want to hide. The selected scenes are displayed in the scene area of the Storyline view. The deselected scenes are hidden.